Just finished a bookcover for Harcourt Publishing that no one will see. Well, not exactly no one--the book will be distributed in schools only, but as of this moment, it remains under wraps. The educational market is very hush hush about their projects. But I think it came out pretty well. 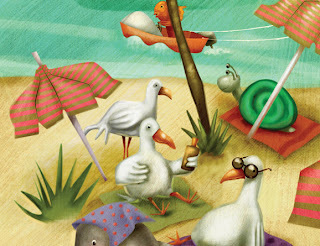 Shhh...here's a snippet of the piece, a preview, if you will. Once it gets published, probably sometime in 2008, then the whole world can see it, well, at least your little sister, brother, nephew, or niece, who will be about 6-8 years in age. As a whole it measures 19.5" wide by 12.25" tall.